Event 17 of the Borgata Fall Poker Open was the $1,560 Purple Chip Bounty Turbo NLH event. There were a total of 79 entries and it was a stacked field filled with plenty of big name pros. When the dust settled Taylor Wilson was the last man standing. It was no cake walk for Wilson who bested a tough final table that included Event 1 winner John Lytle and Aleksi Vandyshev. This is Wilson’s first Borgata Poker Open title and the $26,821 first prize now brings his lifetime poker earnings to over $325,000. After losing a crucial flip holding against Nihal Advani was left with just over 300,000. Just a few hands later he moved all in holding and Taylor Wilson made the call with . 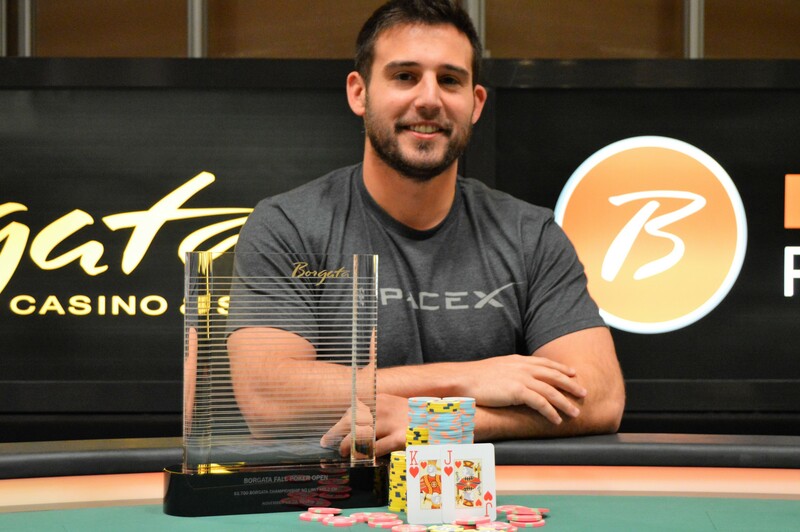 The board ran out clean for Wilson and his pocket fives held up to earn him the knockout and his first Borgata Poker Open title. Nihal Advani is our Event 17 runner up and will earn $14,558. With the elimination of John Lytle in third heads up play is now underway in Event 17. Nihal Advani holds a slight chip lead with 886,000 and Taylor Wilson is playing a stack of 694,000. The two will battle it out for the $26,821 and the trophy and one of these players will be our newest Borgata Fall Poker Open Champion. Taylor Wilson raises to 48,000 and John Lytle moves all in for 172,000. Nihal Advani folds and Wilson makes the call putting Lytle at risk. The dealer fans the flop and Lytle pairs his eight but the turn brings the and Wilson spikes his ace to take the lead. The hits the river and our Event 1 winner Lytle is eliminated in 3rd place earning $9,196 for his efforts. The chips continue to change hands the Event 17 players have been three handed for over an hour. We finally have our first significant pot when John Lytle raises the button to 50,000. Nihal Advani moves all in for 257,000 from the small blind and Taylor Wilson calls from the big. They see a flop of and Wilson checks. Lytle moves all in for 525,000 and Wilson folds. Advani shows but is in bad shape against the of Lytle. The hits the turn and Advani spikes his jack to take the lead. The seals the deal for Advani and he triples up to take the lead as three handed play continues. Aleksei Vandyshev, who had hit the miracle king on the river to banish Abdelilah E. and David F., couldn’t fade a bad runout to continue his run. John Lytle, wounded by the kings of Nahil just a few hands earlier, went with and was behind Vandyshev’s jacks. Aleksei Vandyshev, another strong run, this time 4th for $6,897. The two had almost identical stacks, but Lytle is doubled thanks to running hearts. Arriving at the final table with just a few blinds, Duane Hunton made the most of them. “I’m the guy folded his way here,” he claimed, probably accurately. He couldn’t fold forever, and though he chipped up early, just got in , but couldn’t fade Taylor Wilson’s . The perils of being short – they just don’t fold. A nice 5th place of $5,364 for Hunton. Just now, Nahil Advani takes a huge chunk from Lytle, against , and vaults into the lead. We now will take a short break. Another big pot looked like a set up hand. Lytle opened to 23,000 at 5/10, Aleksi 3bet to 60,000, Siegel shoved, and amazingly, Nihal Advani found a shove to. The board ran out interestingly for the two hands, jacks against Nahil’s kings, delivering each player sets, but in reality, the best hand preflop simply one. Set over set, but not a beat. The real wrinkle was that a one-liner appeared on the river, and Aleksi indicated he would have gotten there. Now that means little, as he couldn’t call, but it did change Siegel’s attitude. “So I’m freerolling… you would have called and won anyway,” he said to Aleksi, implying that if Nahil had different cards, the covering big stack would have knocked him out. Seigel chats with Aleksi. Nahil, background doubles to over 450,000. Good attitude. However, Siegel can’t make his final three bigs work, getting them in good against Lytle’s . Lytle makes quads. Something for Siegel, it turns out, to whine over – as he was joking about earlier. Great run for Siegel, he takes 6th $4,598. Siegel barely escapes, doubling with a q on the river after being severely outflopped.